Each and every blogger loves to earn handsome money online directly from their living room. They have different advertising programs running on their blog, which gives them the worth of their content but do you ever thought that you can earn even more by enabling Google AdSense on the mobile version of your blog. There are lots of Blogger and webmasters, which are unable to realize that mobilizing their website is getting extremely crucial because the percentage of mobile users has increased up to 60%. So, if you are running a Blogger BlogSpot blog and thinking to integrate AdSense in the Mobile version of your website, then you have arrived to the right place. 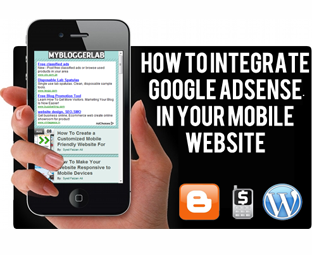 Today we discuss how to insert Google AdSense ad unit in the Mobile version of your Blogger BlogSpot Blog. Note: Before You Check this tutorial its crucial that you first Create a Mobile Friendly Website Check This Link. Google AdSense is a machine which works on feedings, the more you nourish your blog with quality content the more Google AdSense will pump money for you. According to the rough estimates, the popularity of mobile users have jumped significantly from 20% to 50%. If you have not monetized your mobile website with Google AdSense, then you are committing the most illogical mistake, in other words your traffic is just going in wastage. In order to insert Google AdSense in the mobile version of your BlogSpot blog, first you have to create a customized Mobile-Friendly website For Blogger. Once you have successfully created and installed the mobile-friendly website in blogger you are ready to integrate AdSense in it. The steps are extremely straightforward and would only take less than 5 minutes to complete the integration, just do as mentioned bellow. 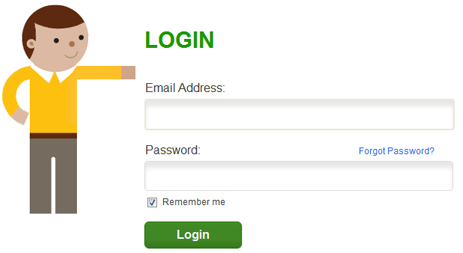 Step#1: Go to http://gomo.dudamobile.com/login and login to your account, which you created while creating a mobile friendly website for blogger. Step#2: After positively logging into your account, you will be able to witness the list of mobile friendly website which you have created till so far. Now select that mobile website where you want to Place AdSense by pressing EDIT button. Step#3: Then your browser will take you to a new webpage, where you will be able to see heaps of App that can be incorporated in your Blogger mobile website. Now just double click Google AdSense from the list of applications and proceed to the next step. 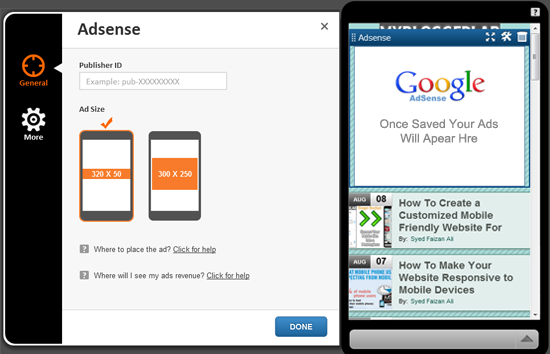 Step#4: Now you have to insert your Google AdSense publisher ID and the size of your Ad. Once you inserted your Google Publisher ID i.e. pub-XXXXXXXXXXXXXXXX and have customized your advertisement dimensions, you can Press the Save Button. Step#4: After applying Google advertisement, you have to re-publish the changes that you have made to your blogger mobile website. So Press the Next button that will be appearing on the top, and then select “Save My Changes Button” to successfully complete the whole process. All Done: So That’s it, now go ahead and grab a Smartphone or any ordinary mobile with internet access visit your website through it and you will notice a picture perfect Google Advertisement appearing on your blog. If you have noticed, you can not only integrate Google AdSense but you can also insert tons of Applications like Slider, Social Widget, YouTube Channel directly into your mobile website with the help of this stunning service sponsored by Google.com. What do you thing about GOMO and DudaMobile? Should they continue this free service? Give your opinion bellow in comments till then peace, blessings and happy earning. free for just 1 year and whos gonna pay 540 US bucks after it ! syed pls help me out how ur top navigation menu works as does it does division of posts acc. to LABELS or something else or these r diff. pages opened up at clicking at diff things in menu ? Brother We have to add each and every single URL By our self their is no automatic stuff here in Blogger. :) Peace and Blessings Buddy. got it boss as blogger is also a free service :P still thanks to google ! i get a series of posts , not a single post ! HOW ? Wow was looking it on Google and Suddenly came on my best friends blog. Thanks for Sharing Faizan.